The Christiansburg Recreation Center hosts the 2018 Health and Wellness Fair on Wednesday, September 19, 2018 from 12:00-4:00 pm. The 2018 Health and Wellness Fair, sponsored by the Blacksburg AARP in cooperation with the Virginia College of Osteopathic Medicine (VCOM) and Christiansburg Recreation Center, includes exhibitors from around the area, including the New River Valley, Roanoke, Salem, Floyd, and others. Exhibitors will be available for visitors to explore ways to stay healthy, feel healthy, and age well. Attendees will have the opportunity to queue up for a flu shot, have their blood pressure or glucose checked, or learn about new immunizations. The fair is not just about medical conditions! Visitors will learn about aging at home. They will be able to gather information on not only physical and mental health but also intellectual, financial, environmental, and cultural health. The Health and Wellness Fair is a great place for participants to learn new ways to stay healthy and engaged. To view the event flyer, visit: https://i.imgur.com/gNU4hbF.jpg. If you have questions, please send an email to Jennie Reilly jenmik@vt.edu, Leslie Pendleton lkpendleton@vt.edu, or Sandra Griffith sandrag@vt.edu. 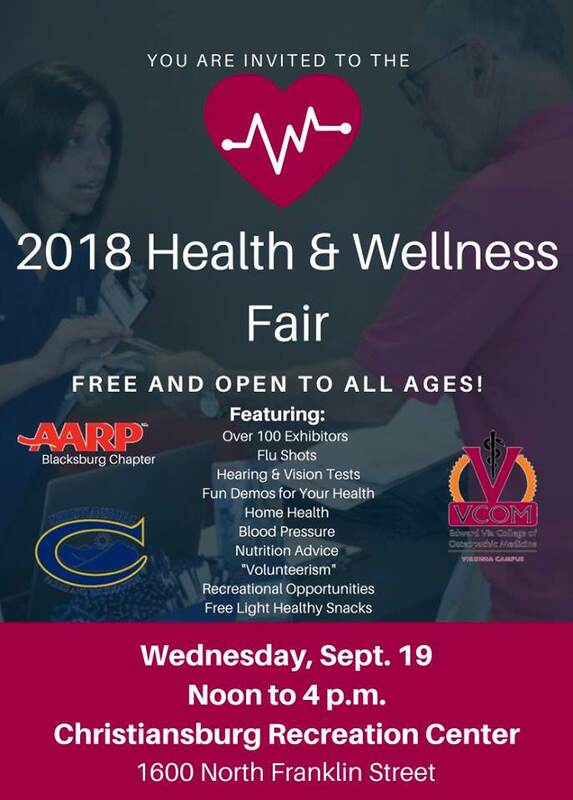 For more information, visit: http://www.blacksburgaarp.org/2018-health-and-wellness-fair or https://www.facebook.com/AARP-VCOM-2018-Health-and-Wellness-Fair-2083179181962239/.